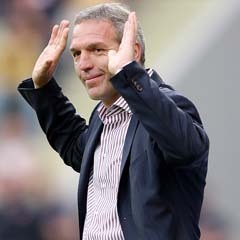 Cape Town - Chippa United coach Ernst Middendorp claims that his job is not under threat, despite a poor run of results. The Chilli Boys have gone eight matches without a win in 2015, and as a result have slipped down to 12th spot, just three points above the relegation zone. But despite talk of the German coach being shown the exit door, Middendorp is adamant that his position is not under threat, and says he has the backing of his chairman, Chippa Mpengesi. "We have a very clear understanding on what our targets are. I made it very clear that the main target, in fact the only target, for a team coming into the PSL was to secure its status to still be here next season," he was quoted as saying by The Sowetan. "This other dream to look at a better position - just forget about it. The second half of the season, in particular for teams coming into the PSL, is difficult because in the first half no one is taking them seriously, but then later it gets more difficult than you would have thought. "I made the chairman aware of this and we have a clear understanding."